This just in: Islam is a religion of peace. 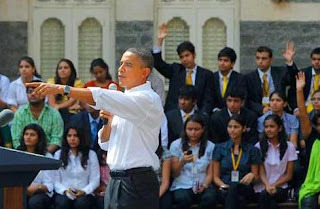 So said Barack Obama yet again on Sunday in India. Even though he was repeating conventional boilerplate that he has repeated many times in the past, and that the Bush Administration repeated before him, his statements in Mumbai signaled his determination to keep the United States firmly committed to the policy errors that flow from this mistaken assumption. There was no surprise in any of that. Obama invokes the great unicorn in which we all must believe (on pain of charges of “bigotry” and “Islamophobia”) but which no one has ever actually seen: a moderate, mainstream and traditional form of Islam that does not teach warfare against and the subjugation of unbelievers. The peacefulness of individual Muslims does not establish the existence of this peaceful form of Islam, although many believe that it does, because when these peaceful Muslims are challenged on Islamic grounds by jihadists and Islamic supremacists, they are vulnerable: jihadists get recruits and justify their actions among Muslims by appealing to Islamic teachings and presenting themselves as the authentic Muslims. Peaceful Muslims must challenge that if — if — they really wish to lessen the influence jihadists have within Islamic communities. The pressuring of Israel. The Palestinian conflict against Israel is, at its foundation, an Islamic jihad; if it weren’t, it would have ended long ago. There have been innumerable attempts at a negotiated settlement, and each one has failed because of Palestinian intransigence, which is founded in the idea that land ruled at any time by Muslims belongs by right to Muslims forever, and non-Muslims (particularly Jews, the worst enemies of the Muslims according to Qur’an 5:82) have no right to establish a state on such land. This is why no Palestinian faction has ever recognized Israel, despite numerous promises to do so, and why Obama’s attempt to hammer out yet another negotiated settlement is doomed to fail, like all of its predecessors, to bring about anything resembling a lasting peace. Obama is assuming, because Islam is a peaceful religion that has been distorted by “a few extremists,” that the vast majority of Palestinians want “peace and justice, and fairness and tolerance” for themselves and for the Israelis. This misapprehension ensures that his peace initiatives are foredoomed. The coddling of Iran. Obama’s hand outstretched to Iran has become the object of international ridicule, including from Mahmoud Ahmadinejad himself, but the American president appears undaunted. He continued to reach out to the Islamic regime in Tehran even as it was massacring its own people in the streets in the summer of 2009 – and missed an opportunity at that time to voice support for the Iranians who were standing up to that regime and risking their lives in hope of a better life. Underlying his relative indifference to the Islamic Republic’s human rights abuses may be his assumption that Islam is a peaceful religion that has been distorted by “a few extremists”; if that is so, how bad can an Islamic Republic be? The mainstreaming of American Muslim groups with links to Hamas and the Muslim Brotherhood. Virtually all of the highest-profile and most influential Islamic advocacy groups in America today have links of various kinds to Hamas and its parent organization, the Muslim Brotherhood, which is dedicated in its own words to “eliminating and destroying Western civilization from within.” These include the Islamic Society of North America (ISNA), the Council on American-Islamic Relations (CAIR), the Muslim American Society (MAS), the Muslim Students Association (MSA), the North American Islamic Trust (NAIT), and others. While the FBI no longer works with CAIR, the Obama administration has had contact on numerous occasions with ISNA officials – and there is no public recognition at its highest levels that there is anything questionable about these groups at all. And why should there be? Islam is a religion of peace! The outreach to the Islamic world. Obama’s Special Envoy to the Organization of the Islamic Conference (OIC), Rashad Hussain, was in Mali recently to strengthen the U.S.’s commitment to aiding the Islamic world. It has been a primary focus of Obama’s presidency, even to the point of redefining NASA’s mission from space exploration to Muslim outreach. All of this, from the disproportionate to the absurd, stems from the core assumption that since there is nothing wrong with Islam, if Muslims are angry at us, it must be because of something we have done – and therefore we must set out to fix it. Yet as Obama has tried to “isolate” these “extremists,” he has earned the ire of other Muslims who are sympathetic to them. Some of them demonstrated against him in Indonesia a few days ago, on the grounds that his foreign policy was not sufficiently different from that of George W. Bush. The president may be forgiven if he was surprised by the vehement reaction against him from members of a group he has worked so hard to court. He may have assumed that if he showed good will and willingness to compromise and make concessions, his gestures would receive a like response from Islamic leaders. And why shouldn’t he have assumed such a thing? After all, it’s a religion of peace!